Not everyone has the same number of bones in his feet. It is not uncommon for both the hands and the feet to contain extra small accessory bones, or ossicles, that sometimes cause problems. Where is the accessory navicular located? The navicular bone of the foot is one of the small bones on the mid-foot. The bone is located at the instep, the arch at the middle of the foot. One of the larger tendons of the foot, called the posterior tibial tendon, attaches to the navicular before continuing under the foot and into the forefoot. This tendon is a tough band of tissue that helps hold up the arch of the foot. If there is an accessory navicular, it is located in the instep where the posterior tibial tendon attaches to the real navicular bone. The accessory navicular is a congenital anomaly, meaning that you are born with the extra bone. As the skeleton completely matures, the navicular and the accessory navicular never completely grow, or fuse, into one solid bone. The two bones are joined by fibrous tissue or cartilage. Girls seem to be more likely to have an accessory navicular than boys. How does an accessory navicular cause problems? Just having an accessory navicular bone is not necessarily a bad thing. Not all people with these accessory bones have symptoms. Symptoms arise when the accessory navicular is overly large or when an injury disrupts the fibrous tissue between the navicular and the accessory navicular. A very large accessory navicular can cause a bump on the instep that rubs on your shoe causing pain. An injury to the fibrous tissue connecting the two bones can cause something similar to a fracture. The injury allows movement to occur between the navicular and the accessory bone and is thought to be the cause of pain. The fibrous tissue is prone to poor healing and may continue to cause pain. Because the posterior tibial tendon attaches to the accessory navicular, it constantly pulls on the bone, creating even more motion between the fragments with each step. The primary reason an accessory navicular becomes a problem is pain. There is no need to do anything with an accessory navicular that is not causing pain. 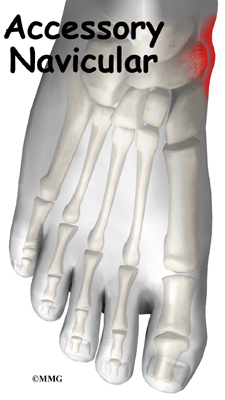 The pain is usually at the instep area and can be pinpointed over the small bump in the instep. Walking can be painful when the problem is aggravated. As stated earlier, the condition is more common in girls. The problem commonly becomes symptomatic in the teenage years. What can be done for a painful accessory navicular? The treatment for a symptomatic accessory navicular can be divided into nonsurgical treatment and surgical treatment. In the vast majority of cases, treatment usually begins with nonsurgical measures. Surgery usually is only considered when all nonsurgical measures have failed to control your problem and the pain becomes intolerable. If the foot becomes painful following a twisting type of injury and an X-ray reveals the presence of an accessory navicular bone, your doctor may recommend a period of immobilization in a cast or splint. This will rest the foot and perhaps allow the disruption between the navicular and accessory navicular to heal. Your doctor may prescribe anti-inflammatory medication. Sometimes an arch support can relieve the stress on the fragment and decrease the symptoms. If the pain subsides and the fragment becomes asymptomatic, further treatment may not be necessary. If all nonsurgical measures fail and the fragment continues to be painful, surgery may be recommended. 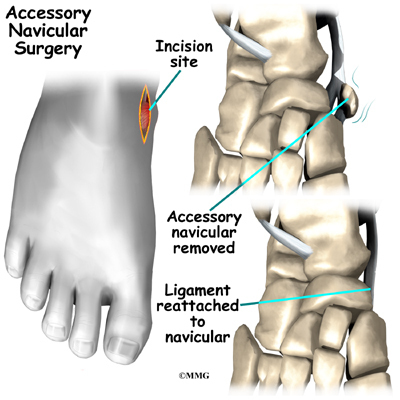 The most common procedure used to treat the symptomatic accessory navicular is the Kidner procedure. A small incision is made in the instep of the foot over the accessory navicular. The accessory navicular is then detached from the posterior tibial tendon and removed from the foot. The posterior tibial tendon is reattached to the remaining normal navicular. Following the procedure, the skin incision is closed with stitches, and a bulky bandage and splint are applied to the foot and ankle. Patients with a painful accessory navicular may benefit with four to six physical therapy treatments. Your therapist may design a series of stretching exercises to try and ease tension on the posterior tibial tendon. A shoe insert, or orthotic, may be used to support the arch and protect the sore area. This approach may allow you to resume normal walking immediately, but you should probably cut back on more vigorous activities for several weeks to allow the inflammation and pain to subside. You may need to use crutches for several days after surgery. Your stitches will be removed in 10 to 14 days (unless they are the absorbable type, which will not need to be taken out). You should be safe to be released to full activity in about six weeks.